A white label truck shipper app solution for your shipping customers to book and track shipments seamlessly with an easy payment option. 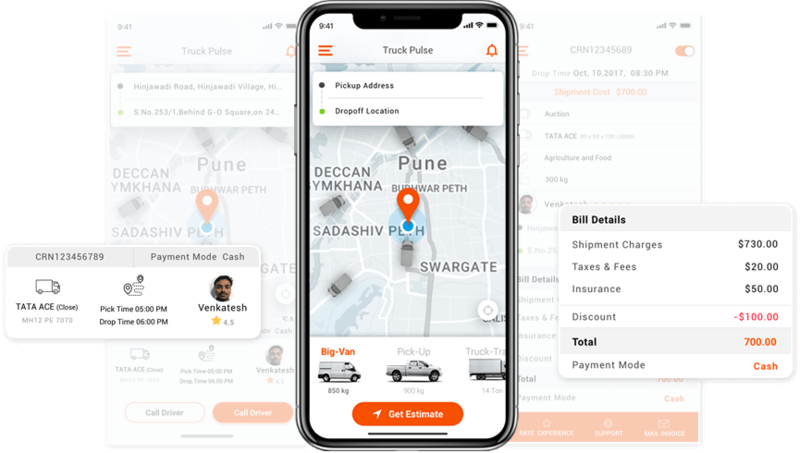 Get a tailor-made trucking app solution for your customers for an easy shipment booking process. Truck shipper app allows easy to sign in options just by providing mobile number and email details. Browse through various available truck types (FTL, PTL) in real-time on a map. Easy load booking options using pickup and drop details plus load details and shipment schedule. Option to view and manage all the past, upcoming and ongoing shipment requests in the app. Real-time tracking option for all the bookings to stay updated with the status. Option to schedule a cargo/load pickup in advance for later. A dedicated section to check the details of all the past shipment bookings. Shippers can refer the FAQs in the app and contact service help desk when they need. Shippers will receive all the critical updates during the shipment through an email, push notifications, SMS, etc. Multiple in-app payment options for the shippers for trouble-free payments. Option for sharing feedback and ratings to the driver once the shipment is completed. We provide the best-in-class Uber for trucking solution to transform the way trucking businesses manage today’s on-demand, digital world. We are committed to successfully launch the apps for our trucking business and startup clients. "Mobisoft Infotech's Sales and Operations department are exceptional. They are very professional with implementing their tasks and especially we are super impressed with their project/ product management skills. It has been more than a year now we are working with this company so, we hold a healthy relationship and it is definitely an ongoing development. Technically, they understand our concept or requirements pretty well and are brilliant in their execution. I highly recommend them! " "I am highly satisfied and happy with Mobisoft Infotech services. They are always available to provide suggestions for new features in the app. My app was delivered right on time and bug free. Their support is excellent. Thanks to Team Mobisoft Infotech!! "